Does the thought of hundreds of guests descending on your property, filling the rooms, restaurant, halls and lobby sound like a dream, or a nightmare? On the face of it, it can seem like a wonderful opportunity for meeting targets, but small cracks that may appear during the day-to-day running of a property can spread and break under the pressure of MICE. Meetings, Incentives, Conferences and Exhibitions (or MICE) are fantastic ways to up your bookings, particularly over quiet seasons, and can generate income year on year when managed successfully. But it is the feedback that you receive year-round, together with the feedback received at such events, that will make sure that your offerings are adequate and ready for MICE. As a growing industry, with a global projected value of over $1,245 billion within the next five years, MICE present a perfect opportunity for venue and accommodation providers who are able to offer the whole-package and exceed expectations for lodging, dining and entertainment to make the most of the expanding market. Properties that find success hosting MICE will not only benefit from the immediate income generated, but will have the opportunity to benefit repeatedly in the future if they meet or exceed delegates’ expectations. This may come in the form of repeat business from companies organising their private functions or those responsible for hosting a variety of public events. And it’s not only the organisers who will be impressed either. A property that is not only able to accommodate hundreds of guests at a time, but still provide excellent service and facilities to each of them in turn will benefit from the best that word of mouth can offer. Delegates will be likely to return not just for the next year’s event, but for trips of other natures as well. How can guest feedback (and a guest feedback partner) help? 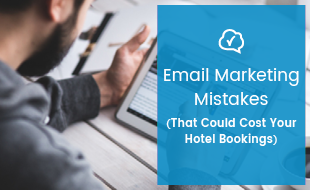 When done right, MICE can be an excellent form of income, repeat direct bookings and the loyalty of hundreds of guests all in one fell swoop. But when filling your property to capacity, there is also the potential for small issues that may have gone unnoticed during regular operations to become stumbling blocks, and result in less-than-impressed delegates, and another venue being booked for the following year. 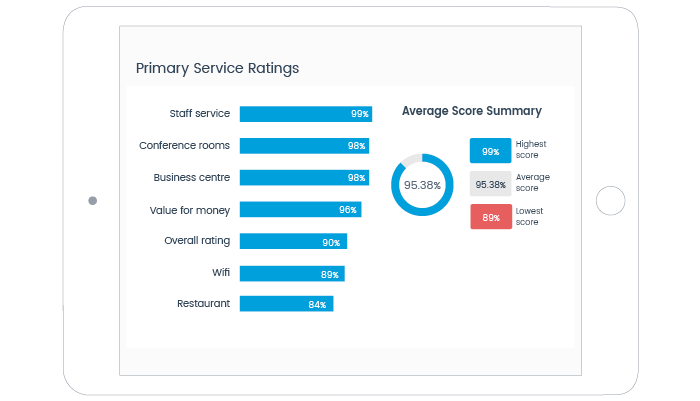 This is where feedback, and a great guest feedback partner like GuestRevu, is instrumental in establishing delegate’s preferences, finding out what your property’s strengths and weaknesses are, and making improvements backed by data. No one wants to be treated as just a head in a bed, however, providing a personalised experience to hundreds of guests at a time can be challenging to say the least. The feedback that you can receive from pre-stay questionnaires will be invaluable in this instance — providing you with details about the delegates before they arrive, and the opportunity to accommodate preferences from the start, rather than learning them during the course of their stay. This makes accommodating meal preferences and food allergies much easier, for example, as arrangements can be made in advance. Accommodation providers also have the opportunity to provide a more personalised experience for delegates of similar MICE events in future, as they can garner a better understanding of the particular needs for each event. For example, if a hotel were to host an annual art exhibition, each year they would be likely to encounter similar enquiries regarding lighting, installation and equipment. Though the staff may not be well versed in the world of art, they can have answers for such questions prepared before the delegates arrive. Any stay at a property is about more than just the room that you provide. But between meetings and conferences, and the slew of talks, presentations, engagements and networking that fills a delegate’s itinerary, coming back to their room for relief and relaxation will be a vital part of any MICE delegate's stay. It’s here where the feedback that you have received from previous guests can leave you reassured that it’s nothing but relief and relaxation that delegates will find. The right feedback survey can drill down into every area of your property, providing insight into the experience you provide. With the right feedback questionnaire, you can find out not only what a guest’s overall impression of their room was, but what their sleep quality was like, how happy they were with its cleanliness, how comfortable the room was in general, and more. 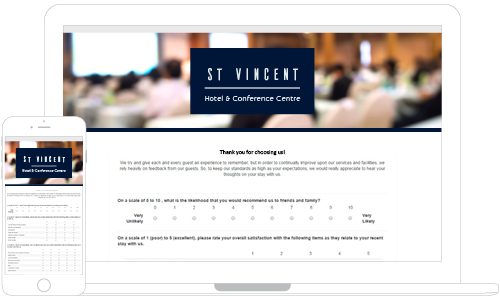 Questionnaires provide scope for in-depth feedback, and provide hoteliers with the opportunity to stay on top of even the smallest details. It’s these small details, after all, which can compound when a service is being provided to hundreds of guests simultaneously. Suddenly a water pressure issue which one guest alluded to in their survey, for example, is being exacerbated by every guest in your property attempting to take their ten-minute break to freshen up. By noting guest feedback about room quality, you can ensure that all of your rooms are up to standard, and ensure that delegates are comfortable not only in the public spaces that your property provides, but even more so in the rooms that you offer. Though delegates may attend MICE events for business, the idiom of “all work and no play” rings true, with such events often branching beyond their business nature. 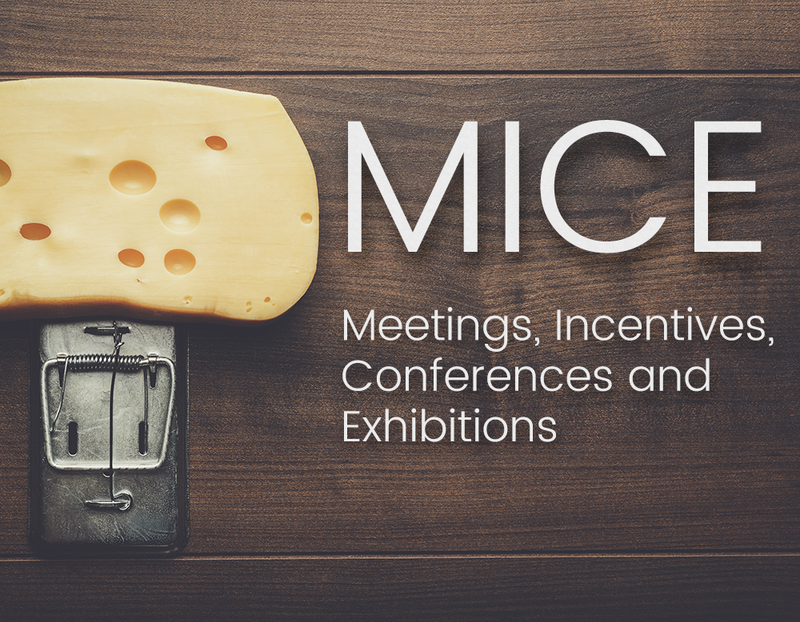 It is this, in part, which often results in MICE being held in destinations further afield, encouraging delegates to attend not only for a meeting, conference or exhibition, but for an experience. However, you do not need to be in an exotic destination to provide delegates with an experience — one can be created in any environment with the help of the right feedback. Food and beverage: With the global trend of authentic food and culture on the rise, sourcing ingredients from local providers and offering seasonal menus will provide an experience that delegates from other areas are unlikely to find elsewhere. Keeping an eye on food-related feedback throughout the year can help you to make sure that you put your best foot forward when hosting events by highlighting your most popular meals. Tour operators: While you may be accustomed to your neighbourhood, delegates are unlikely to be. 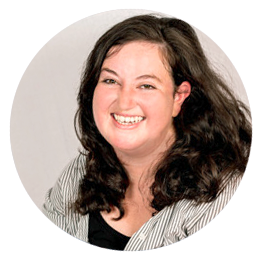 Offering tours, or teaming up with local tour operators can give insights into your area, and asking for feedback can give you fuel for providing MICE organisers and delegates with recommendations for enhancing their experience. Transfers: Knowing that delegates will often be arriving from far and wide, MICE organisers will often favour accommodation that is easily accessible. Offering transfers to and from the airport will be of advantage to any provider looking to host these kinds of events. Feedback can help you to take this one step further by offering transfers at regular intervals to local areas that guests often visit. From sourcing local ingredients for your restaurant, to teaming up with local businesses, engaging with your community and encouraging your guests (delegates and otherwise) to do the same will pay dividends as it will result in an experience rather than simply an event that delegates will quickly forget. Feedback can not only be improved by technology such as pre- and post-stay automated surveys that a partner like GuestRevu can provide, but it can also assist with determining which technologies may be needed in future. With the growth of the MICE sector, the technological requirements that they expect accommodation providers to offer are growing as well. Where in the past a conference may have needed nothing more than a spacious room, a projector and a screen (or blank wall) to be successful, it is now a common occurrence for conferences to require quality connectivity for reaching remote delegates, for example. Feedback can help hoteliers determine where their technology priorities should lie. 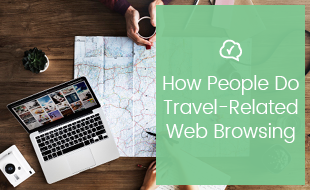 Connectivity may, for example, be perfect, while your check-in procedure is too time-consuming. Investing in self-service check-in technology in this instance could allow for MICE delegates to be allocated their rooms more efficiently. It is the feedback that you get from guests that will show you where your priorities for upgrades and improvements should lie. Operating at full capacity can easily put strain on any property, but a great feedback partner like GuestRevu can be an invaluable asset in assuring that no aspect of your property cracks under the pressure. With questionnaires that address each aspect of a guest’s stay, and dashboards that show service levels across every area of a property, or even a group of properties, it becomes easy to pinpoint areas that can be improved, and work together to improve the overall experience of every guest. And when experiences are consistently great for individual guests, properties are better prepared for hosting events that will see hundreds of excellent experiences. From assisting with personalisation, to informing operational decisions, to monitoring your property from top to bottom, feedback can help any property to prepare for operating at full capacity and providing an excellent experience to hundreds of delegates at a time, and see MICE investing in your property by returning year on year. 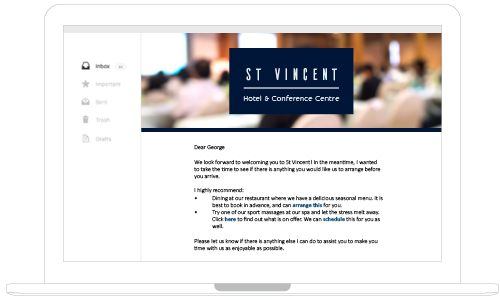 Want to learn about more ways that guest feedback can make your life as a general manager easier? Click on the banner below to download our handy, free ebook.